Part of a larger project to restore the maritime character of Mont St-Michel, the dam on the Couesnon River controls water flow and provides great views. Across the causeway from Mont St-Michel, in the area referred to as Les Portes de Mont St-Michel, are a variety of shops, hotels, and restaurants. The new parking lot and visitor center are in this area. This is also the site of the new dam on the Couesnon River. 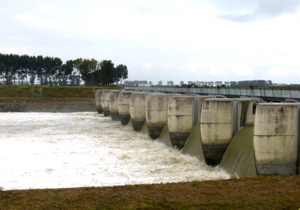 Commissioned in 2009, the dam is designed to push sediment back to the sea. It does this through carefully timed releases of water. Water is released six hours after high tide, for a period of between two and five hours. This helps widen the river bed and control sediment. 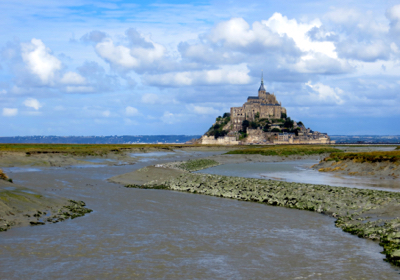 The dam is a critical part of the project to restore the maritime character of Mont St-Michel. However, it is much more than that. It is beautifully designed as a work of art, with a lovely wooden deck and terraces from which you get excellent views of Mont St-Michel. You can walk across and/or sit and enjoy the view. Mont St-Michel and the Couesnon River, as seen from the dam. In addition, there are educational sign boards and water level markers that explain the dam's functioning and its importance to Mont St-Michel. 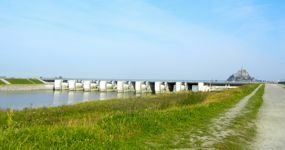 Next to the dam is a walking path which will take you to the nearby towns of Beauvoir and Pontorson. Pontorson has hotels, restaurants, and a train station (regional service). Above, The dam, with Mont St-Michel in the distance. Below, Rushing water at the dam.